Ann Clark Cookie Cutters A6-276 - History of ann clark for over 30 years, ann clark has been the brand of cookie cutters that families and baking professionals have turned to. We create cookie cutters that make great cookies. Bake and decorate cookies for Valentine's Day parties, the person your secretly admire or someone you love. Made in the usa & certified food safe - our cutters are made from tin plated steel and are made in the USA, in Rutland, Vermont. The techniques we have developed over three decades of manufacturing have set us apart, permitting us to create modern, complex shapes with crisp corners and intricate details. Valentine's day 4 piece cookie cutter set - you will give and get plenty of hugs and kisses with Ann Clark's Valentine's Day Cookie Cutter Set which contains Lips, Heart, Letter X & O cookie cutter shapes. 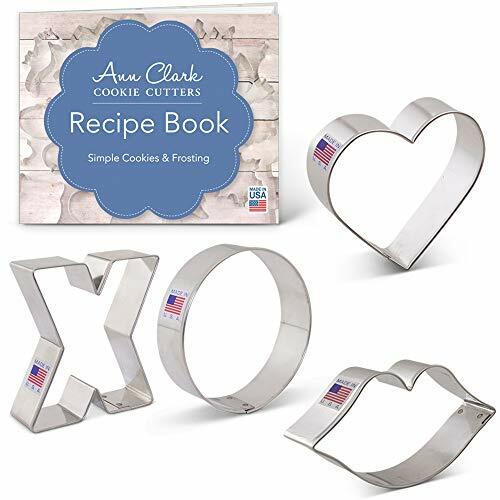 Lips, Heart, Letter X & O - Valentine's Day Cookie Cutter Set with Recipe Booklet - Ann Clark - 4 piece - USA Made Steel - The company was founded in 1989, when the artist, Ann Clark, had the idea to transform her popular pig shaped ornament into a cookie cutter. Careful thought is given to each design and how our customers will use it. We test our products yearly to ensure that they are food safe. Our shapes have fun designs, thick details, and are sized well for baking. Family owned - for over 30 years, ann clark has been the brand of cookie cutters that families and baking professionals have trusted. Blending her unique folk-art designs and custom hand painted recipe cards, Ann launched her first line of cookie cutters and Ann Clark Ltd. Sprinkles | Galentine Sprinklefetti | Gorgeous Sprinkle Blends for Valentine's Day! Sweets Indeed - Spread the love - or actually - SPRINKLE the love on your Valentine's Day desserts and creations. Perfect for valentine's Day or GALentine's Day! Sprinklefetti is sweets indeed's premium, hand blended mix of long, nonpareils, crunchy jimmies Sprinkles, different sizes of sugar pearls and sugar shapes. Made in a gluten free, dairy free and nut free environment! *Contains soy Gorgeous sprinkle blends! BEAUTIFUL COLORS! Great for all events and parties! Cupid's got nothing on this beautiful sprinkle blend. Our galentine blend includes multi-colored candy hearts. Tasty candy Heart Shapes! . • Sprinkles | Pucker Up Sprinklefetti | Gorgeous Sprinkle Blends for Valentine's Day! • Sprinkles | Pretty In Pink Sprinklefetti | Gorgeous Sprinkle Blends for Valentine's Day! 4 Piece - Ann Clark Heart Cookie Cutter Set with Recipe Booklet - Tin Plated Steel - 2 5/8", 3 1/4", 3 5/8", 4"
Ann Clark Cookie Cutters A6-103 - She has since moved on to other endeavors. Use as a pancake mold, soft fruits, cheese, fondant, or for cutting cookie dough, bread, sandwiches, or craft clay. Recipe booklet included - it's easy to get baking and cookie decorating with these fun shapes and the recipe booklet included with every set. Family owned - for over 25 years, ann clark has been the brand of cookie cutters that families and baking professionals have trusted. Set includes: teardrop heart - 2 7/8" x 2 5/8" teardrop heart - 3 7/16" x 3 1/4" teardrop heart - 3 7/8" x 3 5/8" teardrop heart - 4 1/4" x 4" Family OwnedFamily owned and operated since 1989, Ann Clark Cookie Cutters The Cookie Cutter People from Vermont has grown from a small gift company to the largest manufacturer of cookie cutters in America. Soon after its launch the company became a family affair. Thank you for choosing our American made cookie cutters. Certified safetyour cookie cutters meet safety requirements under California's Proposition 65 for lead and cadmium, Bureau Veritas country of origin marking, CPSIA for lead, and FDA - GRAS for metal intended to come into contact with food. 4 Piece - Ann Clark Heart Cookie Cutter Set with Recipe Booklet - Tin Plated Steel - 2 5/8", 3 1/4", 3 5/8", 4" - You will know you've purchased our American made cookie cutter by the "Made in the USA" label on every product. Perfect for valentine's Day or GALentine's Day! Heart cookie cutter set - make heart shaped cookies with our Heart Cookie Cutters. As a customer, you can count on quality products that are consistently available and ship right away. Gooday SYNCHKG103386 - Great for all events and parties! Perfect tool for making cake. Perfect tool for making cake. We test our products yearly to ensure that they are certified food safe. Care instructions / ideas for use - hand wash and dry immediately; not dishwasher safe. 3. You can use it to stir the syrup, draw the outline of cake shape, let cake finer. You can use it to stir the syrup, draw the outline of cake shape, etc. Item description: 100% new and Hight Quality Material:Stainless steel+plastic Size:12. 5 cm / 4. 92 inches long Plastic handle 7 cm /2. 76 inches long Stainless steel part 5. 5 cm/2. 16 inches long color: Send Randomly Item Feature: 1. Simple design, very durable and very easy to use 2. Gooday 6 PCS Scriber Needle Modelling Tool Marking Patterns Icing Sugarcraft Cake Decorating - . Warming tips: please take care of these scriber needles, do not give your kids and let them play with it, thank you. 4. Celebrate love, weddings, valentine's Day, fun fondant shapes, and engagements with beautifully decorated cookies, original craft projects or cookie cutter favors. Wilton 702-6015X - 227 g. Shop medium-size 8 oz meringue powders and more from Wilton. Perfect tool for making cake. You can use it to stir the syrup, draw the outline of cake shape, etc. F cake shape, with the small needle can recover smooth discharge air. Use as a pancake mold, fondant, sandwiches, soft fruits, or for cutting cookie dough, cheese, bread, or craft clay. Recipe booklet included - it's easy to get baking and cookie decorating with these fun shapes and the recipe booklet included with every set. Family owned - for over 25 years, ann clark has been the brand of cookie cutters that families and baking professionals have trusted. Color: White. 8 oz. Also can be used to pop air bubbles, smooth out the icing, fill in corners, mark lines on cakes, help get fondant letters out of cutters/tappits, ect. Wilton Meringue Powder - 8 oz. - Family owned and operated since 1989, Ann Clark Cookie Cutters has grown from a small home business to the largest manufacturer of cookie cutters in America. Material:stainless steel+ Plastic ; 6 Pieces Modeling tool scriber neddle. Simple design, plastic handle 2. 7 inches long, very durable and very easy to use ;Size: 132 mm /5. 2 inches long, Needle part 2. 5 inch. Ann Clark Cookie Cutters A6-148 - Every cookie cutter ann clark makes is made out of tin plated steel in a rigidity of metal that is strong enough to easily cut through cookie dough and other soft foods but is flexible enough to permit us to create the detailed shapes our customers love. Design process at ann clark, we know cookie cutters and the professionals who use them. We test our products yearly to ensure that they are food safe. Blending her unique folk-art designs and custom hand painted recipe cards, Ann launched her first line of cookie cutters and Ann Clark Ltd. Gorgeous sprinkle blends! BEAUTIFUL COLORS! Tasty candy Heart Shapes! Use as a pancake mold, or for cutting cookie dough, fondant, soft fruits, sandwiches, cheese, bread, or craft clay. USA Made Steel - Ann Clark Cookie Cutters - Onesie, Bib, Rattle, Bottle, and Baby Carriage - Baby Shower Cookie Cutter Set with Recipe Book - 5 Piece - Recipe booklet included - it's easy to get baking and cookie decorating with these fun shapes and the recipe booklet included with every set. Family owned - for over 25 years, ann clark has been the brand of cookie cutters that families and baking professionals have trusted. As long as the bubble burst, let cake finer. Color: White. We test our products yearly to ensure that they are certified food safe. Care instructions / ideas for use - hand wash, and dry immediately, cheese, not dishwasher safe. Maxdot - Celebrate love, valentine's day, and engagements with beautifully decorated cookies, weddings, fun fondant shapes, original craft projects or cookie cutter favors. Made in the usa & certified food safe - our cutters are made from tin plated steel and are manufactured in the USA, in Rutland, Vermont. Family owned and operated since 1989, Ann Clark Cookie Cutters has grown from a small home business to the largest manufacturer of cookie cutters in America. Material: the icing bag ties are made of silicone which are sturdy and non-toxic; The silicone material enables you to use them for many times. 5 piece baby shower cookie cutter set - everyone at the baby shower will "ooh" and "ahh" over adorable shapes in this set: Baby Rattle, Bib, Bottle, Onesie, and a Stroller. Recipe book included - this very popular set includes cookie recipes to capture the heart of the mom-to-be! Great for new arrivals, gender reveal parties and showers. Made in the usa & certified food safe - our cutters are made from tin plated steel and are manufactured in the USA, right in Rutland, Vermont. Maxdot 24 Pieces Icing Bag Ties Silicone Decoration Bag Ties for Cupcakes Cookies and Pastry - Resealable top opens completely for easy measuring. Certified Kosher. Family owned and operated since 1989, Ann Clark Cookie Cutters has grown from a small home business to the largest manufacturer of cookie cutters in America. Material:stainless steel+ Plastic ; 6 Pieces Modeling tool scriber neddle. Simple design, plastic handle 2. Wilton 710-032 - 5 piece baby shower cookie cutter set - everyone at the baby shower will "ooh" and "ahh" over adorable shapes in this set: Baby Rattle, Onesie, Bib, Bottle, and a Stroller. Recipe book included - this very popular set includes cookie recipes to capture the heart of the mom-to-be! Great for new arrivals, gender reveal parties and showers. Made in the usa & certified food safe - our cutters are made from tin plated steel and are manufactured in the USA, right in Rutland, Vermont. Certified Kosher. Candy heart shapes in pink and red add a pop of color to cupcakes, cookies, and candies. 3. 25 oz. Multiple usages: these icing bag ties can be applied for many occasions, which are essential decorations for cupcakes, cookies, bakery and parties, such as cooking, candies and pastry. 3.25 oz. - Wilton Jumbo Heart Sprinkles - Package includes: the package comes with 24 pieces silicone icing decoration ties which can meet your various needs; Color: light purple. Great for all events and parties! Sprinkle lots of heart into your Valentine's Day sweets using these fun and festive heart sprinkles. As long as the bubble burst, let cake finer. Also can be used to pop air bubbles, smooth out the icing, help get fondant letters out of cutters/tappits, fill in corners, mark lines on cakes, ect. Wilton 601-5580 - Warming tips: please take care of these scriber needles, do not give your kids and let them play with it, thank you. Made in a facility that also processes soy and wheat. Net weight: 3. 25 oz. Certified kosher; made in a facility that also processes tree nuts, egg and soy. Certified Kosher. Perfect tool for making cake. Color: White. 227 g. Shake out a little love for Valentine's Day with heart-shaped sprinkles. You can use it to stir the syrup, draw the outline of cake shape, etc. 8 ounces can. Made in the USA. The concentrated gel-based formula gives your batter, buttercream or royal icing a beautiful hue without thinning it out, so color away! Gorgeous sprinkle blends! BEAUTIFUL COLORS! Wilton Icing Colors, 12-Count Gel-Based Food Color - Can help pick up decorations off of your mat/table like polka dots, etc. Use as a pancake mold, bread, sandwiches, or for cutting cookie dough, fondant, soft fruits, or craft clay. Family owned - for over 25 years, ann clark has been the brand of cookie cutters that families and baking professionals have turned to. Multiple usages: these icing bag ties can be applied for many occasions, which are essential decorations for cupcakes, bakery and parties, such as cooking, cookies, candies and pastry. Package includes: the package comes with 24 pieces silicone icing decoration ties which can meet your various needs; Color: light purple. Wilton 417-2588 - Hand Wash recommended. Great for any occasion. Can help pick up decorations off of your mat/table like polka dots, etc. Just roll out fondant or gum paste, press down with the standard steel Cut outs and lift away. Remove shapes with small spatula. Perfect for valentine's Day or GALentine's Day!28. 3 g jars. Set of 12 1/2-ounce icing colors for tinting buttercream, Royal Icing, fondant, and more. Spectrum of primary colors plus Teal, Brown, Burgundy, Black, and Copper. Icing colors can be mixed to create beautifully customized shades. With cut outs fondant cutters, it's easy to make fun shapes for your fondant cakes and cupcakes. Certified kosher; made in a facility that also processes peanuts, fish, shellfish, tree nuts, milk and wheat products. Wilton 417-2588 6-Piece Nesting Fondant Double Sided Cut Out Cutters, Hearts - Made in the USA. You can use it to stir the syrup, draw the outline of cake shape, etc. We test our products yearly to ensure that they are certified food safe. Care instructions / ideas for use - hand wash, cheese, and dry immediately, not dishwasher safe. Multiple usages: these icing bag ties can be applied for many occasions, cookies, bakery and parties, such as cooking, which are essential decorations for cupcakes, candies and pastry. Package includes: the package comes with 24 pieces silicone icing decoration ties which can meet your various needs; Color: light purple. Ann Clark Cookie Cutters 1076N - 5 piece baby shower cookie cutter set - everyone at the baby shower will "ooh" and "ahh" over adorable shapes in this set: Baby Rattle, Bib, Onesie, Bottle, and a Stroller. Recipe book included - this very popular set includes cookie recipes to capture the heart of the mom-to-be! Great for new arrivals, gender reveal parties and showers. Made in the usa & certified food safe - our cutters are made from tin plated steel and are manufactured in the USA, right in Rutland, Vermont. Bottle. Color: White. We test our products yearly to ensure that they are certified food safe. Care instructions / ideas for use - hand wash, and dry immediately, cheese, not dishwasher safe. Ann Clark Extra Large Heart Cookie Cutter - Tin Plated Steel - 5 Inches - Convenient to use: you can wrap your decoration bags with the tie, just squeeze out the icing when you need, then move the tie according to your needs to ensure the squeeze pressure. Fast and fun. Resealable top opens completely for easy measuring. Dimensions: size of the icing bag ties is approx. Net weight: 3. 25 oz. Easy to make 3D shapes.